Pumpkin Ginger Soup | Food E.
‘Tis the season to cook with pumpkin. You’ve been bombarded by orange at the farmer’s market, inundated with pumpkin recipes from your daily email recipe newsletters, and overwhelmed by Starbucks and Dunkin’ Donuts commercials featuring pumpkin flavored everything. I would say it’s cliche, but really… it’s just delicious. Below is an incredibly easy recipe that yields a flavorful soup that would serve as a lovely first course to any fall meal, or as a hearty lunch with crusty bread on the side. Don’t hold back, friends… give in to the power of pumpkin. Heat olive oil in a large stock pot over medium heat. Add onions and cook until translucent, about 8 – 10 minutes. Add garlic and ginger, cook for another 2 minutes. Add salt, pepper, pumpkin, stock, cream, and hot sauce. Stir until combined and turn down heat until the soup is simmering. Simmer for 25 minutes, occasionally stirring. Use an immersion blender to blend* in the pot, or pour soup into a standing blender and blend until completely pureed. Replace soup in the pot and heat until hot and ready to serve. 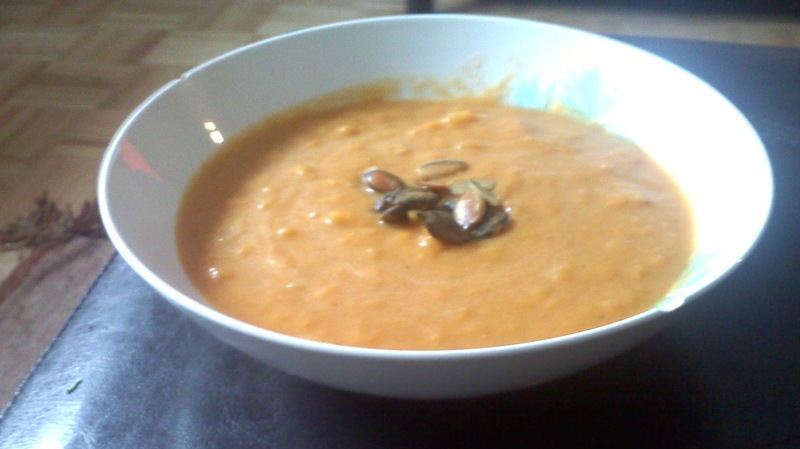 Top with crunchy pumpkin seeds if desired. *Note: you don’t necessarily have to blend this soup, but I found the crunchy onions distracting so I ended up blending the entire pot after I ate one bowl. It was much creamier and much more flavorful after all. If you don’t want to go through the hassle of dirtying your blender, though, it’ll still be delicious without the blending. looks really good. i will have to have someone make some for me but, who? Let me know when you whip up another batch. Would you eat this?! I will definitely have some for you next time you come over. Not tonight because it doesn’t fit with my meal… but soon.